See the full changelog with over 50 game improvements on our community forum! Check the videos below to pick your favourite. Or get all GT3 cars with a special discount in a pack. The all new Callaway Corvette C7 GT3-R builds on the famous Corvette Z06.R GT3 and once again comes with more performance and aerodynamics. This astonishing racing car was developed by the company Callaway Competition based in Leingarten (Heilbronn, Germany), and has a 6.2-liter V-8 under its hood producing up to 600 HP, making it the quickest race-spec C7 developed as of yet. The Corvette is available now! The Mercedes-AMG GT3 was developed with the ambition to win. Based on the production version of the GT and with the wealth of experience acquired from the achievements of the SLS AMG GT3. It pairs high-class technology with a spectacular design. It impresses with maximum safety, precise dynamics and easy driveability. Here you can find it in the store. The latest generation of the Audi R8 LMS is following in the footsteps of its successful predecessor, featuring even more race car technology. It combines lightweight qualities with a unique safety concept and a highly efficient 585 HP V-10 engine. 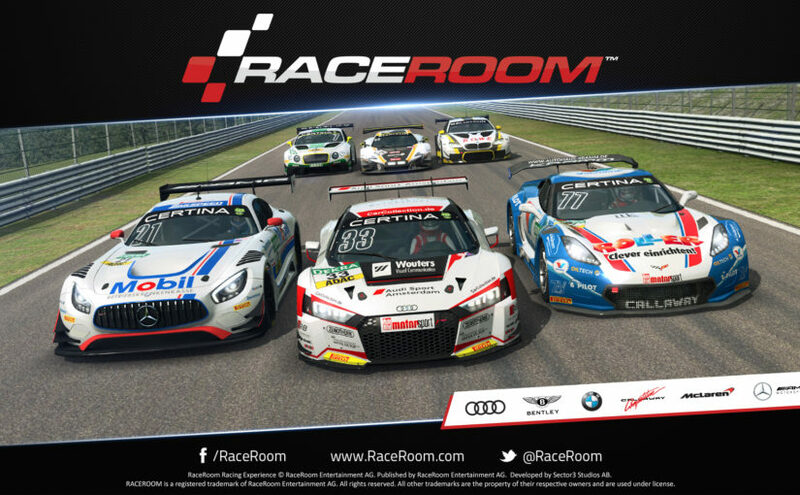 The car is available for RaceRoom here.